When you visit our breathtaking beach, we hope to provide plenty of moments that will take your breath away. One way to make moments count is packing up a picnic … and seeing where the day takes you. Here are some great places to enjoy a picnic. Some call this park the best-kept secret on the island. It’s quiet away from the crowds, with benches to enjoy the coastline where you may see dolphins swimming by. Covered pavilions and picnic tables provide shade from the sun while you enjoy your packed lunch. Afterwards, take a swim or watch the sunset. There are restroom and shower facilities if you need them. Because of the park’s scenic beauty, it’s a favorite for beach portraits, so bring your camera. Note: This is one of few beaches with wheelchair access, with long ramps to the dunes. For a picnic under the trees with loads of recreational activities, this community park is the place to be. Here, you’ll find a disc golf course, tennis courts, a little league field and one-mile fitness trail – in case you feel the need to walk off your lunch. There’s also a playground for the little ones, so you can kick back and watch them run around. Just off the main drag in Downtown Fort Walton Beach is a site set on preserving history, from 14,000 B.C. to modern times. This is a great place to create a day in your own history, while learning about the people who’ve picnicked here before you. Among them are Native Americans, European explorers and pirates of local lore. Bring your picnic to Heritage Park for a lovely lunch under trees who have stood tall above it all. Just behind the Miracle Strip Parkway in Downtown Fort Walton Beach is The Landing, offering 700 feet of waterfront, a boardwalk, boat ramps, fishing pier, gazebo, entertainment stage and playground. This is a beautiful place to picnic, and you may even hear some live music. Lay your blanket under the trees and watch the day go by – a great spot for couples or families, tucked away from the hustle and bustle. Many special events are held here throughout the year, so check out what’s going on during your stay. If you don’t feel like going far, just set up shop in the sand behind our hotel. Rent a chair and umbrella, or lay claim to your spot with your new picnic blanket. The beach beyond our back door is among the most beautiful in the world, and you may even make friends with some fellow guests! Fully updated in 2005, this complex on the inland waterway of Okaloosa Island features a large green space for picnicking, frisbee throwing, running around … or laying on a blanket looking for shapes in the clouds. There are tall pines, covered pavilions and some of the cleanest bathrooms around. Fish from the dock, or take a swim. The peaceful, shallow waters are perfect for small children, roped off so boats and jet skis can’t get too close. At this little park overlooking the sound, you’ll view spectacular sunsets from the shore or the pier. There are clean restrooms and a vending machine with ice. Perfect for birdwatching, geese and herons are among the wildlife you may witness along the well-maintained waterfront. A children’s playground, picnic pavilions and walking trail round out the experience. Bring your picnic behind the Boardwalk to take in all the activity on a vibrant, popular beach. Before or after you eat, hit the playground or sand volleyball courts, or make a splash in the Gulf of Mexico. There are fun shops to explore, as well as treats like fudge and ice cream on the Boardwalk above, which is also home to some fun nightlife within walking distance of our beachfront hotel. Getting to this trail is a bit of a hike (or drive, that is.) Once you get there, the real hike can begin. The Eglin East segment of the trail toward Destin makes its way through a vast pine forest with a storied history. Established in 1940 as a military reservation for munitions testing, the forest is now one of Florida’s favorite scenic spots for hiking … and you’ll need that picnic lunch to go the distance. Note: This is for serious backpackers. This protected park is tremendously beautiful, with 6,000 feet of pristine coastline directly on the Gulf of Mexico. 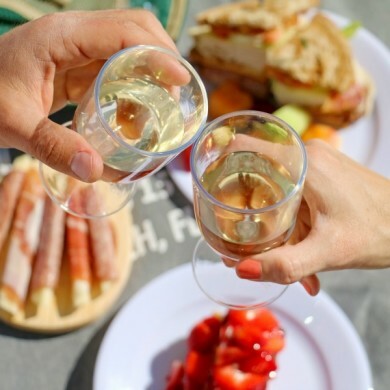 Sit yourself down in the sugar white sand to enjoy our picnic lunch, then explore the park – home to flora such as pines, oaks and dune rosemary, as well as fauna including shore birds, dolphins, sea turtles and reptiles. There are picnic pavilions, a beach access boardwalk and outdoor showers. Stay a while.